Last weekend Bogdan and I attended our second American Thanksgiving in Amsterdam. Last year we were invited for a very intimate Thanksgiving dinner by our dear friends M and N in Almere – a smaller city about 40 minutes from Amsterdam by train. 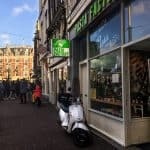 This year we were invited to our friend C’s place in the red light district for a Friendsgiving potluck. Working in events, C knows how to plan a potluck and already had a set menu. We opted to make brie & blackberry tarts and mac & cheese. 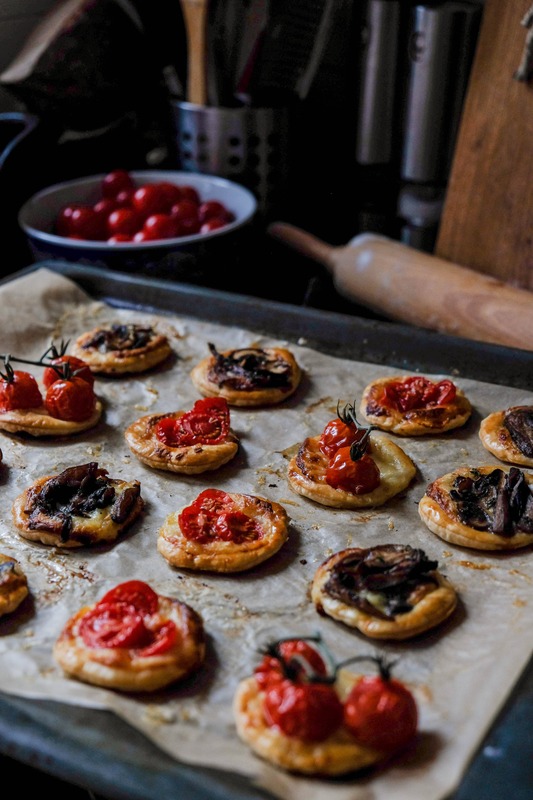 I am of the belief that there can never be enough savoury starters at a holiday party, so I also started playing around with a recipe for a gruyère and mushroom tart. I really enjoy making very finicky hor d’oeuvres. It’s a moment to slow down and pay attention to the details. 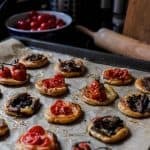 Fortunately since I found pre-made puff pastry at our local AH supermarket, these tarts didn’t end up being nearly as involved as they look. For just a bit of effort you get quite a nice looking holiday appetizer. Of course they can be filled with virtually anything you can think of. If you’ll be transporting them like I did I recommend waiting until they cool before packaging them so that they don’t get soggy from steam and condensation. 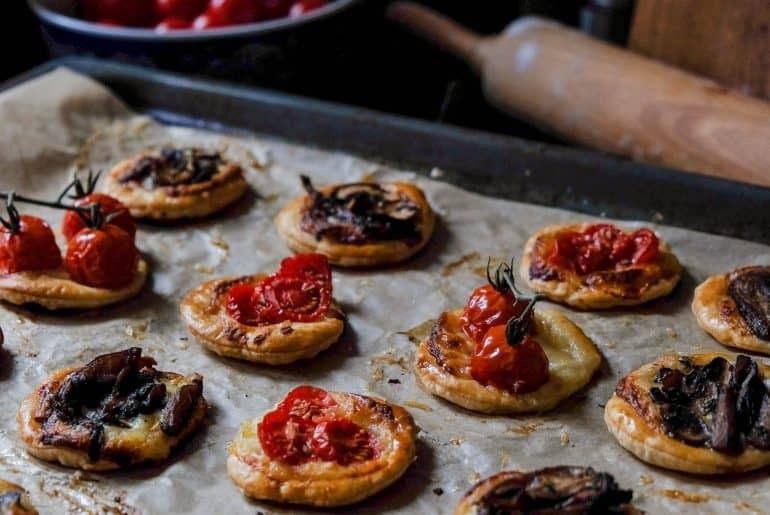 A savoury puff pastry tart made with rich gruyère sauce and either cherry tomatoes or a mushroom trio with thyme, garlic and black pepper. 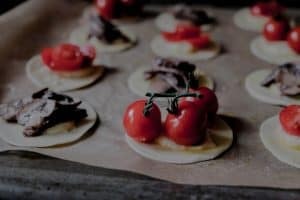 It’s easy to put together and makes for a beautiful holiday party appetizer. Cut mushrooms into small pieces and sauté in 1.5 tbsp butter until they’ve reduced and liquid has evaporated. Add the garlic (minced or crushed), black pepper, thyme and another 1/2 tbsp butter then cook 1-2 more minutes and remove from heat. 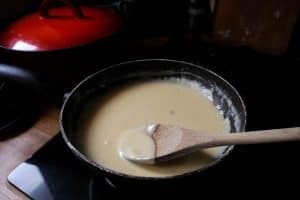 Heat 1.5 tbsp butter in a saucepan and add 1/2 tbsp flour when sizzling. Mix and add 3/4 cup of milk and then whisk slowly until thick enough to stick to the back of a spoon. Add gruyere and stir until melted. Set aside. Put puff pastry on a floured surface and roll it out evenly to make it a little bigger and flatter. 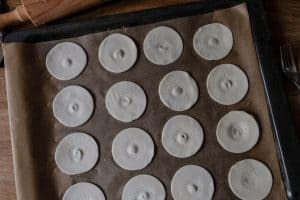 Use a circle pastry cutter to cut out pastry rounds and then move them to a parchment paper covered baking sheet. Press an indentation into the center of each round and then use a fork and puncture a circle around the area to let steam escape. Quickly whisk the egg with about a tsp of water until it’s smooth and use a basting brush to brush the egg wash over each pastry round, concentrating especially on the edges. 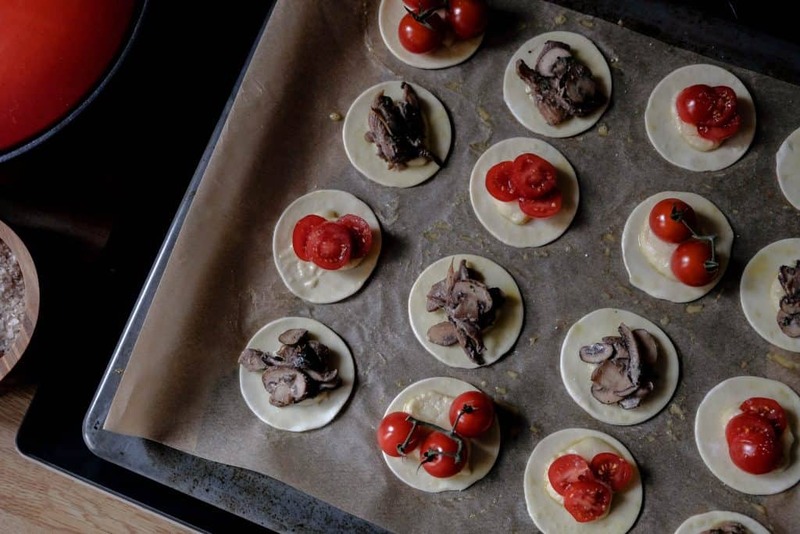 Add about 1 tsp of the cheese sauce and a spoonful of the mushroom mix or otherwise sliced or whole cherry tomatoes to each round. Bake at 350F/175C for 20-25 minutes or until puffed up and golden. Sprinkle with a bit of chopped curly parsley before serving. For the puff pastry I used a 270 gram package – 40cm x 24cm.